So unless you’ve been living under a rock, you will know that I have recently moved house, as I’ve being telling everybody who will listen about it. I’m now all moved into my final student house ready to start my final year in September (Internal screaming). Today I just thought I’d give you a bit of a glimpse into what my new room is like, please bare in mind its harder to photograph than it is video these sorts of things so you don’t get the cosy feeling given by the lighting etc. 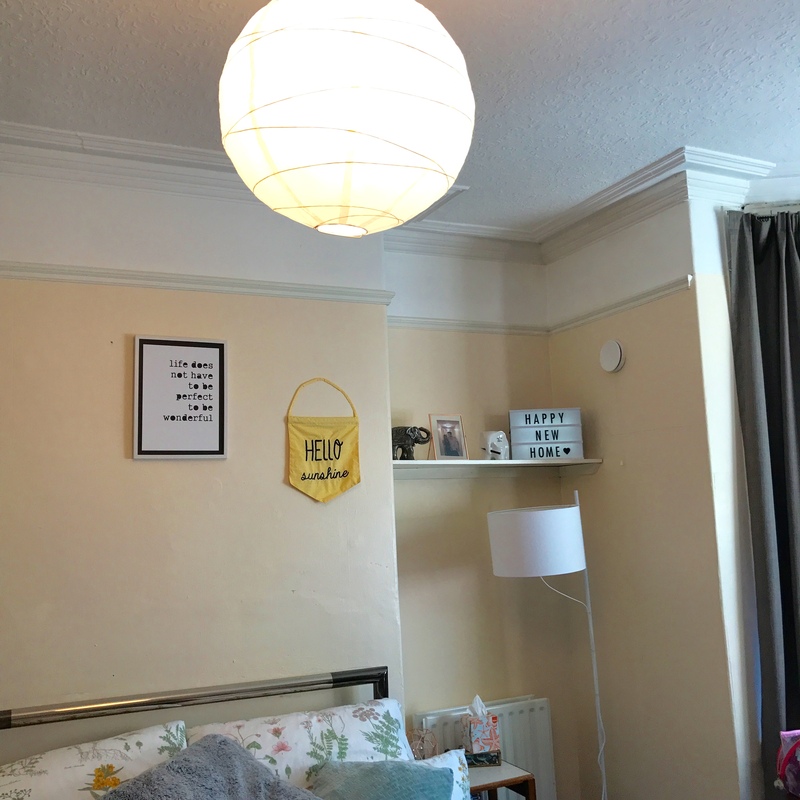 Anyway, this room is the largest bedroom I’ve ever had in my life, my main aim was to make it feel cosy and lived in rather than feeling like a huge space I couldn’t fill. I feel like I’ve done a pretty decent job as making it feel my own, with the help of a few strings of fairy lights, some greenery, a trip to ikea and a spot of DIY. 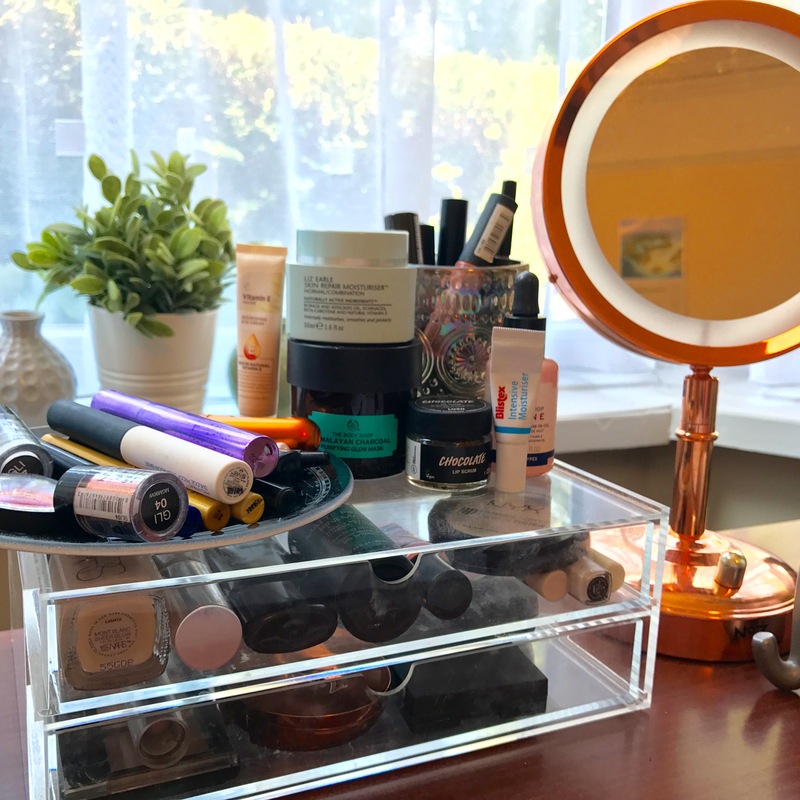 So In front of the bay window, I have a huge dark wood desk, that has drawers on either side, it is the absolute perfect writing desk/ beauty station. I would go as far as to say this is my favourite area of my room. On the right I have my record player and makeup brushes, moving to the centre is my makeup collection, which has drastically shrunk over the last year or so (Which I’m actually really happy about). The desk is full of copper and rose gold tones, including my No7 Light up mirror (limited edition sorry! 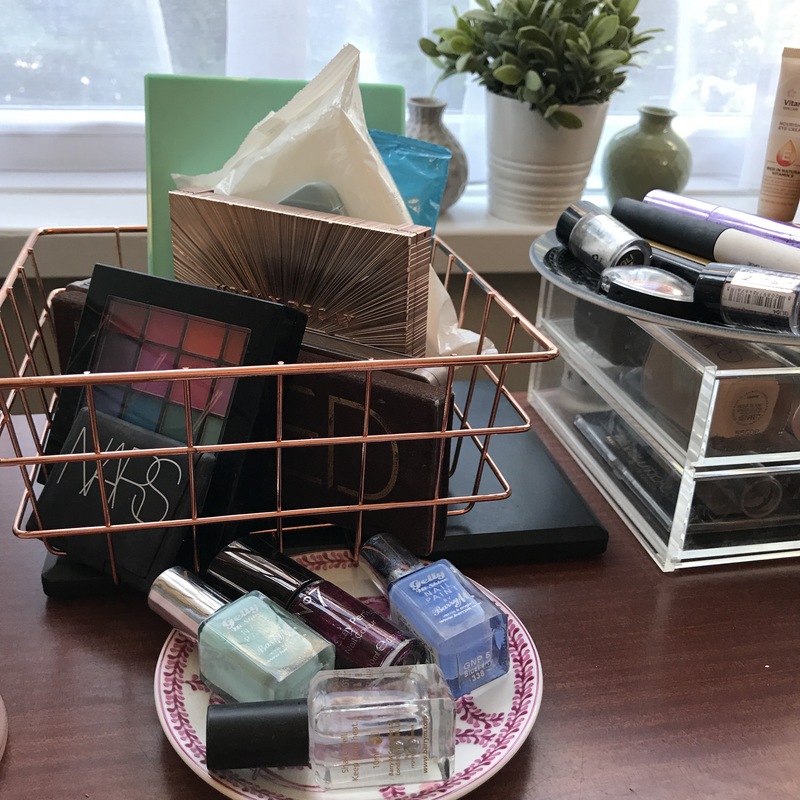 ), basket, containing my eyeshadow palettes and my vase. 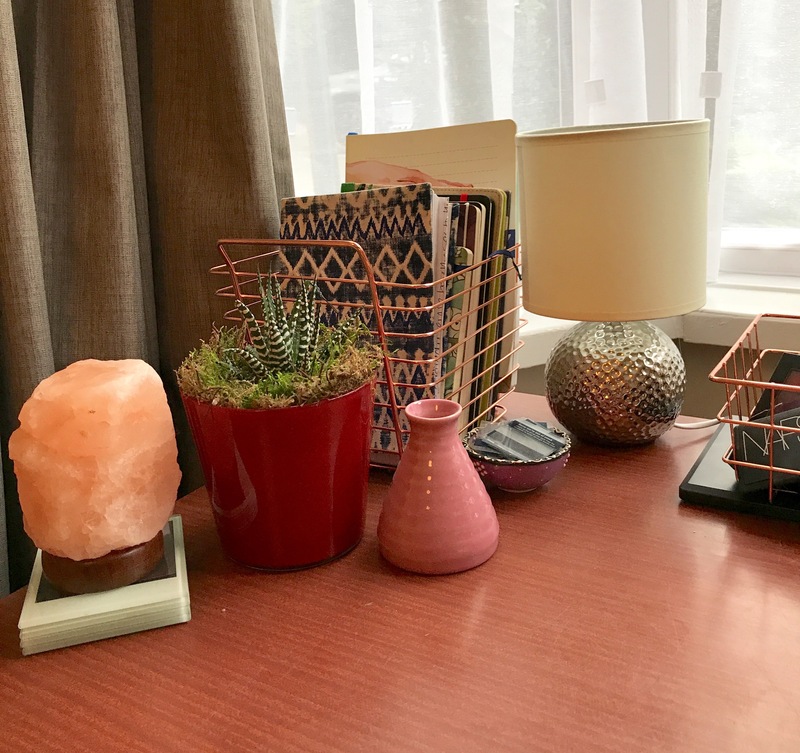 To the right is my new cactus, a Himalayan Salt lamp and my basket full of notebooks and blog plans. Taking the centre stage is my marble slab, which is actually a giant chopping board but I use for blog photos and writing on. Muji Storage is the perfect amount to have a varied but uncluttered makeup collection. All copper baskets are from Primark but can’t be linked. 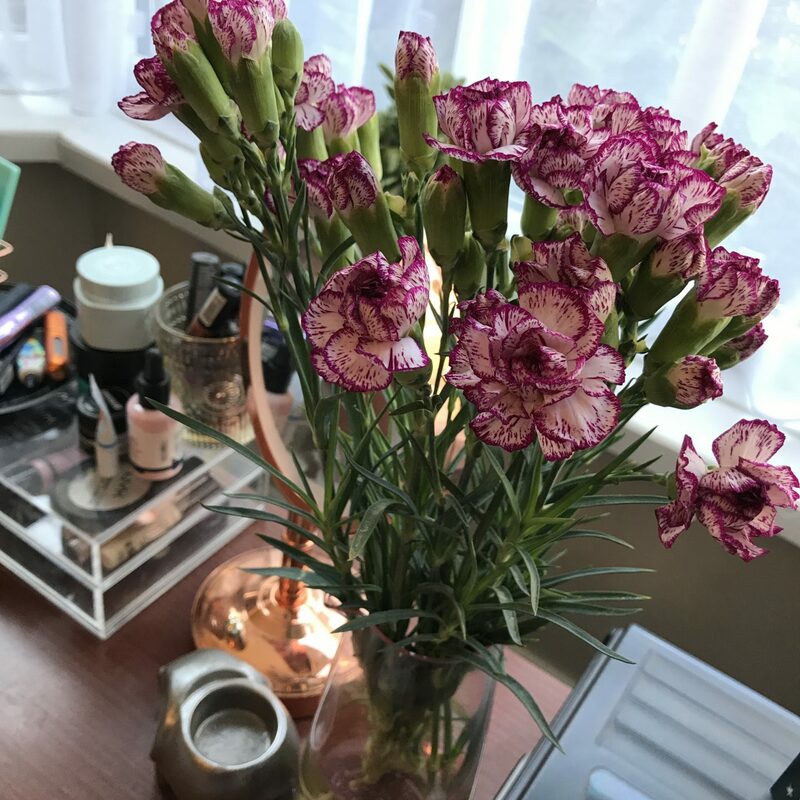 These beautiful flowers, which have lasted ages were actually from Tesco! Lamp and Vase from Ikea. 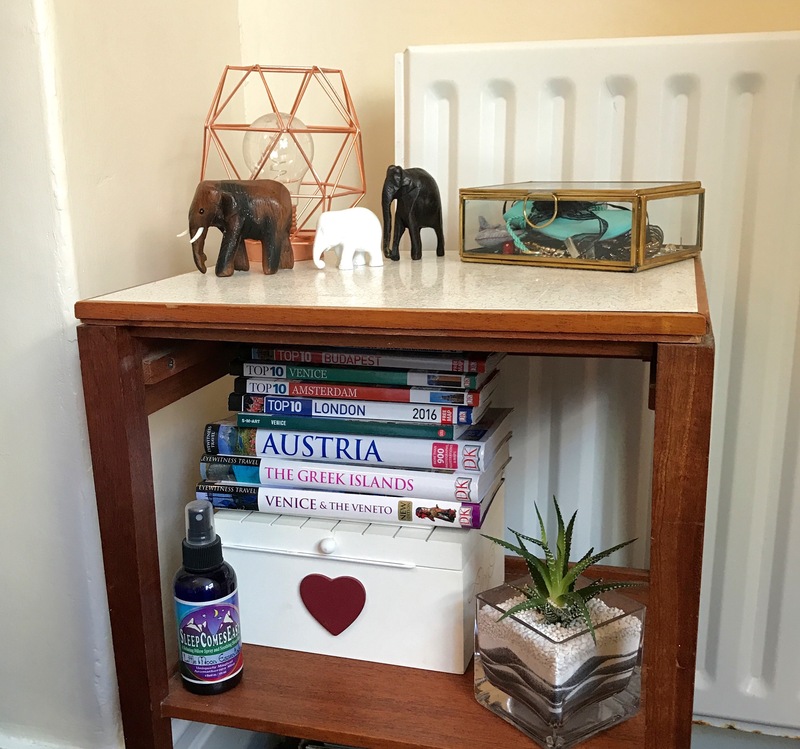 Moving round my room towards my bed is a shelf, where I have displayed a couple of photo frames, my light box and elephant ornaments, anyone that knows me, knows I love elephants with a passion! Underneath this is my free standing lamp (From Next but not currently on the website) to let a bit more light in during the evenings and just to the left is my bedside table. On here I have stored my memory box full of tickets, photos, wristbands and other moments that I just can’t part with, my cactus, Neville, who has been with me since day one at uni and my travel guides. On the higher shelf of the table I have my jewellery, a small copper light and yet more elephants. 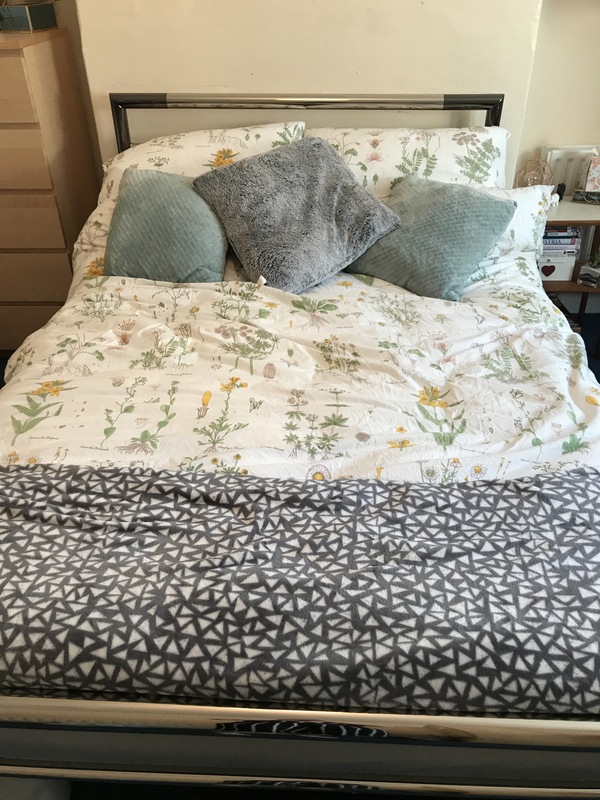 Then to the bed, you may recognise the bedding from my more recent posts, it’s still going strong in the new house and I still love it. Above the bed I have my framed quote and banner, I’m hoping to add to this wall with my Van Gogh Print from Amsterdam and maybe even a few more pieces, I have my eye on a John Cooper Clark Quote. 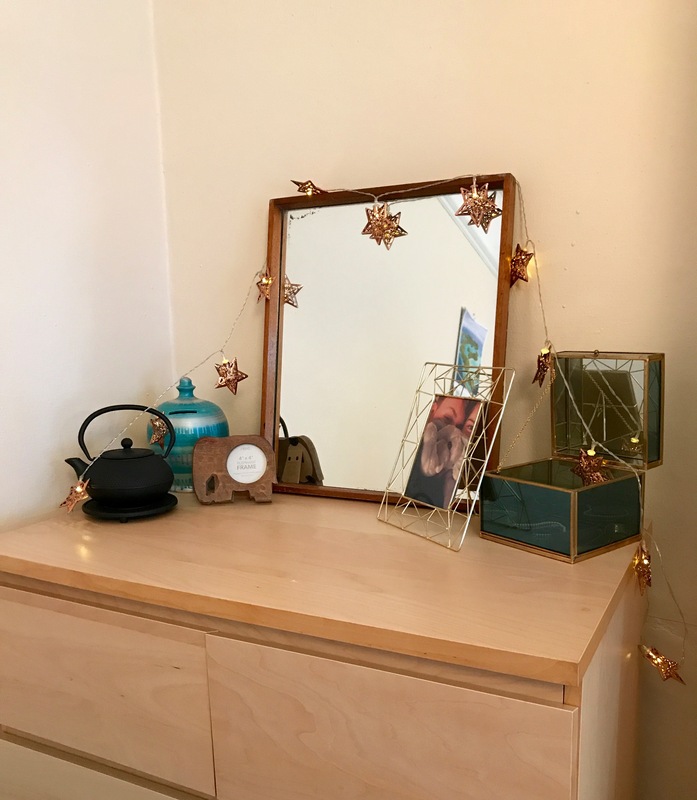 Moving past my bed and towards the opposite side of the room is my chest of drawers, I’ve adorned this with a mirror, some star lights, a glass storage box, my Japanese style teapot and a photo frame which I am yet to fill (yes- it’s another elephant). Even further round is a small chest of drawers topped with all of my books, which it appears I forgot to photograph, but basically it is stacked high with books I still need to read. Finally past the door, just before my wardrobe is my newest edition. This was the most difficult thing I have ever had to construct in my life, it took me and Savannah well over an hour because they had included the wrong parts, but I just made do because I wanted it to be ready straight away. 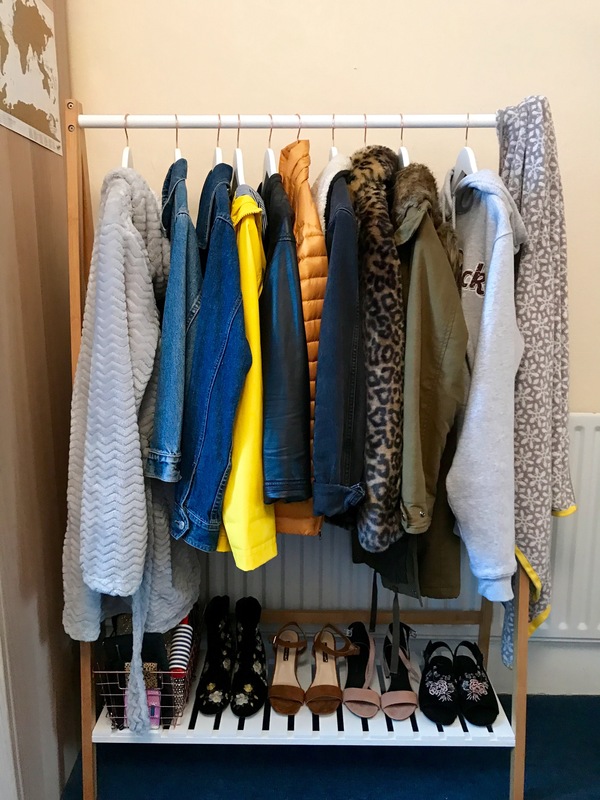 My new Clothes Rail! 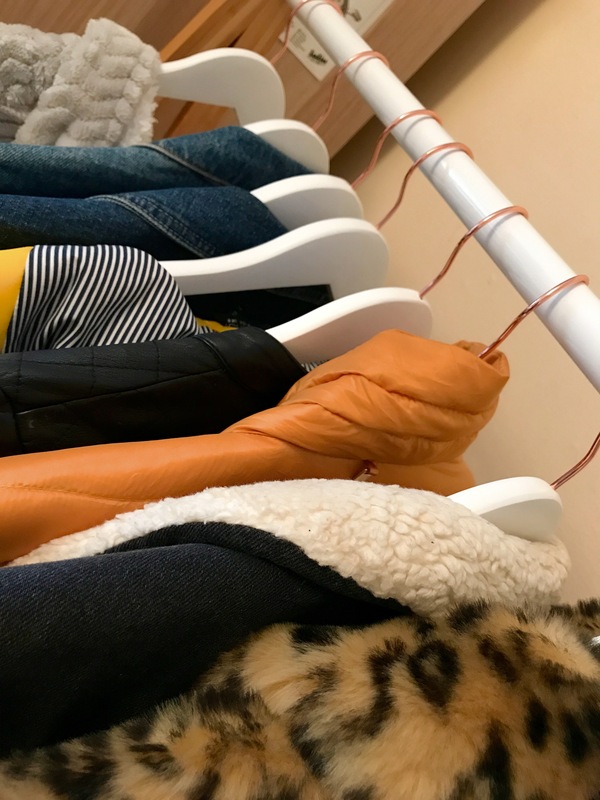 I bought one to store all my coats and jackets on but I thought it would be perfect for featuring clothes in my blog posts. 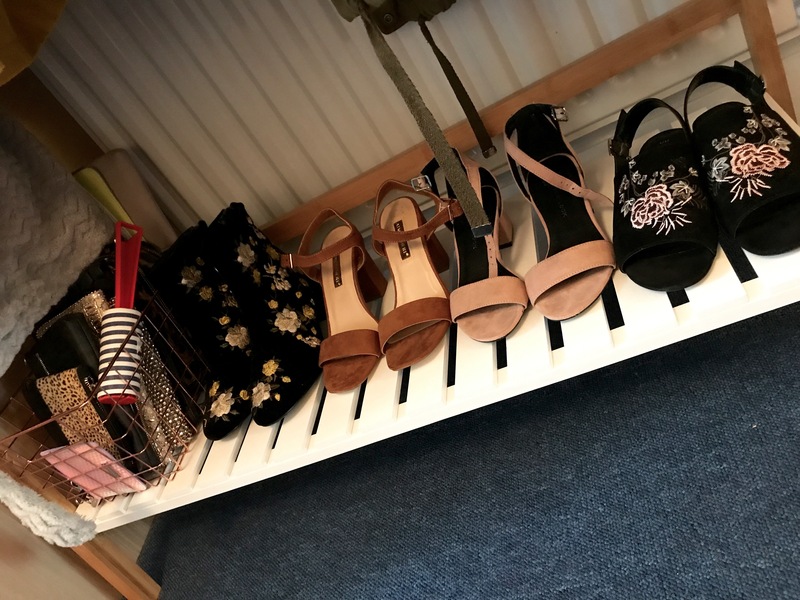 I’ve added some details like some pretty shoes, a copper basket full of bags and purses and some copper and white wooden hangers to keep it all looking uniform (again from Primark). 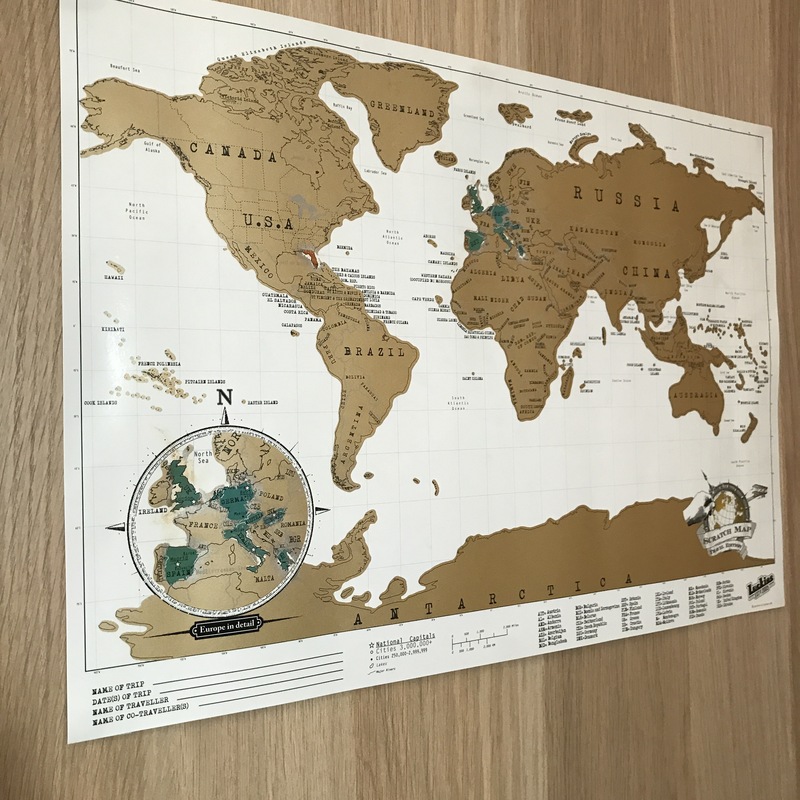 Finally the last finishing touch is my world travel scratch map, where you scratch off the foil over any country you’ve visited. So far it doesn’t look like I’ve been that far (but that’s because its super tiny) but I plan to have a much more colourful map one day! So there you have it, that’s my room. I feel like I’ve captured my own taste quite well despite it being a standard student house. Let me know what you think in the comments below and feel free to ask where anything is from as well! I love the copper elements to your room! I LOVE the “life doesn’t have to be perfect to be wonderful” quote! So, so cute! Congrats and beautiful room!! Love the desk design ✨ Check out my latest posts? That map is so cute! The cooper wire basket is a lovely addition as well as the star lights. I love elephants too. Fairy lights are such a great way to make your room more cosy. I’m so curious to see what the inside of Primark is like. (I live in the states). I’ve been decorating my bedroom as well. That sounds like my type of my shop and right? You are welcome. Your new room is very beautyful, I wish you happy days at home! Hi there! I recently started a blog similar to yours, and was wondering if you could check it out or give me some tips to get started! I LOVE your blog and am really inspired by your posts and content. Thanks so much! You have such a beautiful room Meg! Stay blessed! !